Agape Spain News: Violet Ngo, the Spanish Roegner! Violet Ngo, the Spanish Roegner! Violet Ngo Roegner was born November 23rd at 3:34am in Granada, Spain. Violet es the youngest member of the Roegner family. Our fellow staff Garrick and Dziu, national directors of the Student Ministry in Spain, just became parents for the third time, but it´s their first time to be parents of a daughter born in Spain. Both mommy and daughter Violet are doing very well. They arrived home on Saturday. The delivery and recuperation have gone well; and, as they explained to us, their experience in the hospital was a very positive one. They are very happy. 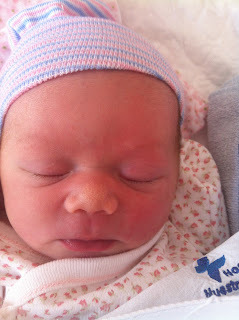 Garrick told us that her older brother and sister are very happy with Violet´s arrival as well. Evelyn thinks she has received a doll as an early Christmas gift and wants to hold her in her arms all the time. Mathis tells her jokes and makes funny faces whenever she cries to help cheer her up. We are so happy for all of them. Many congratulations!